Will Oysters Save the World? Cirque de Sea: A Multifarious Tale With Delightful Prospect is a scientifically based comedy about sea creatures written for adults and suitable for children 10+. The story’s central character is an oyster named Sammy Spat, a super hero water-filtering machine! 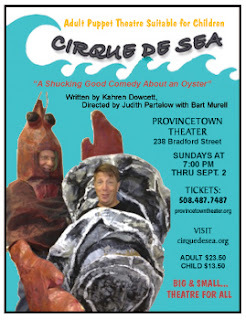 Through the play, program notes, and audience talk-backs with marine biologists, aqua culturists/farmers, and the theatre artists, the audience will learn key scientific features about marine ecology, the oyster’s roll as a keystone species, and the creative process. The play also touches on other socially relevant thematic material; bullying, self-acceptance, friendship and loyalty, and personal empowerment. The staging of the play is done with “Lion King like” giant and life size puppets and masks, and combines music, dance, and poetry in a show that is as educational as it is entertaining. There is a workshop element that precedes the production to creatively engage the community and/or schools offered in collaboration with scientists. The show is a shucking good comedy for young and old alike. And like Sammy Spat, it’s one in a million! Call Kahren Dowcett at 508-737-4220 to discuss how your organization, business, or school curriculum can benefit by becoming involved. Donations to advance the work are gratefully accepted and are tax deductible. 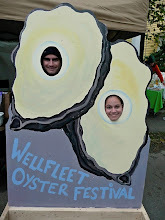 Will Oysters Save the World is intended for community, economic, and environmental betterment. Tickets are available online at by clicking here.